Lucy Thurber’s The Insurgents sometimes feels more like a manifesto-in-the-making than a play, which makes it more intellectually engaging than artistically satisfying. It’s a call to arms, quite literally, beginning with a framing device in which the actress playing the central character, Sally, draws our attention to the gun she cradles, a move that makes certain we’ll focus on that gun and where it’s pointed for the rest of the evening. (Fortunately, it’s not a simple “Chekhov’s gun” made much of at the beginning only to go off in the third act, but more of a signpost to the problems Sally’s grappling with.) The Insurgents is a call for change, and a dramatization of people and ideas that often get lost in discussions of American history and American art. To that extent what Thurber has to say is important, but the piece is clunkily overstuffed with speechifying, and it often feels like the needs of character and story are buried by oratory and the need for structural symmetry. Sally Wright (Cassie Beck) was supposed to be the one who got away from a place where most people’s fates are set by the first grade. The small rural New Hampshire town where she was raised used to be a farming community, then it was a mill town: now there’s nothing left. Sally’s mother died years ago; her father, Peter, pieces together construction jobs when he can; her brother, Jimmy, works on cars when he can. But Jimmy and Peter are scraping by, barely holding on to their house, as are their neighbors and the rest of their community. The town has been abandoned by the global economy and the American dream, but its inhabitants don’t want to just pack up and abandon their home. They want to find a way to keep themselves and their families safe, and have the tiniest bit of hope for their future. Sally, with her college athletic scholarship, embodies that hope for her family, all of whose dreams hang on her success and the possibility that she can claw a foothold for all of them into the capitalist machine. But when an injury ends her athletic career and with it her college scholarship, she goes a little wild. She drops out, and travels the country for six years – most recently doing stints in New Orleans and Detroit – and now, for reasons we don’t find out till the end of the play, she’s come back home. Her father and brother are happy to see her – they were worried about her, for one thing, but for another, the local diner is looking for a fill-in waitress and they could really use the extra income. But Sally, still trying to work through the lessons she’s learned from two mentors (her college coach and her boss in Detroit, a self-made restaurant owner) focuses instead on research into Americans of the past. The people she’s obsessively studying could be called heroes, or revolutionaries, or terrorists, depending on how you look at them, which is of course the point: abolitionist John Brown (Dan Butler, doubling as Sally’s father), slave-uprising leader Nat Turner (Craig “muMs” Wright, doubling as Jonathan, the Detroit boss), Oklahoma City bomber and anti-government crusader Timothy McVeigh (Aaron Roman Weiner, doubling as Sally’s brother), and Underground Railroad guide and spy Harriet Tubman (April Matthis, doubling as Sally’s college coach). Three of these quests ended in arrest and execution, it’s worth noting. And as she combs through the lives of these figures, looking for a cause, a belief system, and an enemy, they hover around the periphery of the scene and enter her world, fired up to right the wrongs of their own times. Director Jackson Gay rhythmically weaves the mundane details of modern life (Raul Abrego’s hyperreal set makes that rural kitchen tangible down to the brand of coffee they buy in the bulk-store size) with the passionate words of those who gave up mundane lives for their causes. And as the insurgents, all four actors go for broke with their fiery orations; Matthis and Wright are particularly effective. Beck, playing a lost and confused character, has a less showy role, but still Cassie’s anger and fear hit hard when they need to. The speechifying can derail the energy of the piece, making it seem like its main project is to give all the characters their moment on a soapbox. In addition to the historical figures, we get life lessons from Sally’s coach and from her boss Jonathan, both of whom have been mentors and moral compasses for Sally, though she’s having a hard time holding on to their lessons. And we also get monologues from Sally and her father and brother, who are grappling with frustrations and injustices of their own, ones less visible and less clear-cut than the battles fought by those forebears or even the contemporary African-American characters, who are strong black role models trying to find their own paths through an often reflexively hostile world. The play lurches from point to counterpoint, but it’s sometimes hard to find the real and specific people under the oratory, which starts to shade into parable. 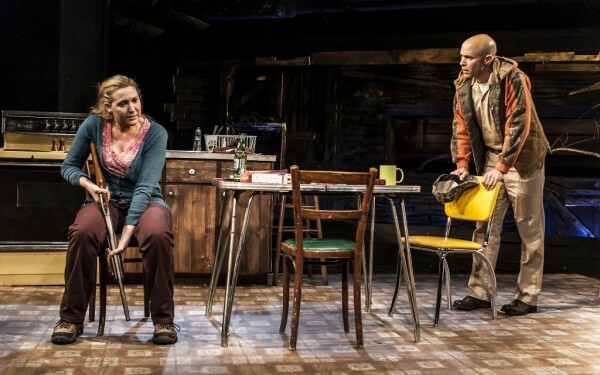 Still, these characters – especially Sally and her family, members of a white rural working class slipping inexorably into poverty and powerlessness – and their struggles are important because American politics and American pop culture all too often only include them to either romanticize or vilify them. Thurber does neither, acknowledging their prickliness and small-mindedness and stubbornness but also their tenderness and strength. Sally, who stepped away just long enough to see their home and the capitalist system that surrounds it from the outside, has gotten perspective to fight, but doesn’t know how: “Nobody wants the system to crumble. And there’s nothing to fight against.” In the face of her frustration, anger, and fear, Thurber’s attempt to end on a more hopeful note felt inadequate against the scope of the problems identified here. The play seems to be seeking the spirit of a new American revolution, by juxtaposing this struggle with Harriet Tubman and John Brown and the fighters against more obvious injustice: questioning what it means to hold Timothy McVeigh, uncomfortably, alongside Nat Turner. It’s a valiant and valuable project, even if the resulting play is frustratingly inelegant.